This blog is dedicated to Ashley, who shouldered the burden of my illness her entire senior year in high school. I love you, Sweet Angel. Standing in the hall by my classroom door as students changed classes, I watched worriedly as teenagers carried backpacks that forced them to lean forward, their backs stooped by the burden. I once voiced my concern to a petite girl and asked why she didn’t leave some of the books in her locker. She told me that she didn’t even remember her locker combination because she never used it. 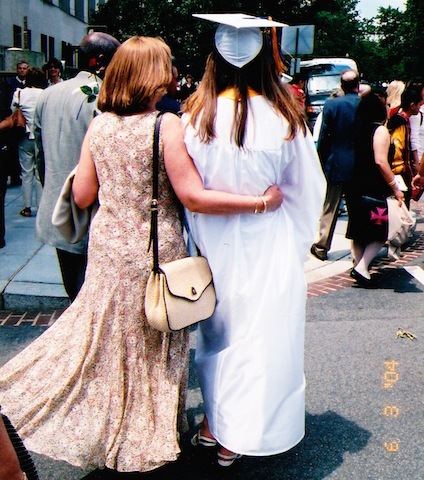 When I raised my eyes in astonishment, she explained that in middle school she learned that leaning down to her bottom locker and turning her back to the hoards in the hallway was more dangerous than just carrying everything with her. After that I noticed more carefully the few students who carried one or two books and a notebook in the crooks of their arms, sometimes dropping them in a flurry of snowy white paper that other students trampled over in their rush to get to class on time. Only when a sympathetic teen or I stopped to help the harried student did other students give us a wide enough berth to allow a safe retrieval of homework. I often heard students complain that they couldn’t wait to leave and get into “the real world,” but schools are, indeed, a microcosm of that bigger world beyond those brick walls. We adults react in similar ways as we watch one another carry our burdens on our backs. All too often, we hurry on with our own lives, oblivious to the loads of others. Worse yet, we scoff at the strain of others, laughing that they think they have burdens when our own are so much greater. The better angels among us stop to help us with our burdens, even if it’s just to listen. And when we’re powerless to help, we’re like the student who voiced the greatest platitude of high school students—that the real world they imagine will be better than the insular world of high school. We adults, who have long since made it to the high school version of the real world, have a similar platitude: God will not give you a burden that is too great to bear. I have smiled each time someone says that to me, happy to have their empathy. But inwardly I wonder whether that saying is true. I know many people, including believers, who have buckled and collapsed under the wearying weight of life. There have been many translations since the King James that do not use the word temptation, but in context, the verse follows a warning from Paul to the church in Corinth to avoid sexual immorality and idolatry. It has nothing to do with the troubles we humans are destined to face. On no soul doth God Place a burden greater than it can bear. It gets every good that it earns, and it suffers every ill that it earns. [Pray:] “Our Lord! Condemn us not if we forget or fall into error; our Lord! Lay not on us a burden Like that which Thou didst lay on those before us; Our Lord! Lay not on us a burden greater than we have strength to bear. Blot out our sins, and grant us forgiveness. Have mercy on us. Thou art our Protector; Help us against those who stand against faith.” (Surah Al-Baqarah 2:226, tr. Yusuf Ali). And even this verse seems to acknowledge in the prayer that God has and does lay such burdens on human beings and that a prayer for mercy is really our only hope. As long as humanity endures, we humans will continue to behave like high school students with heavy backpacks. Some of us will laugh, some of us will pray for deliverance, and, in the meantime, most of us will voice platitudes when we don’t know what else to do. In the end, when prayers for deliverance seem unanswered, our best hope is to find and to be those better angels that help pick up the scattered pieces and shoulder some of the load. How heavy is your backpack? Tell me a story of better angels. Previous PostIs It Love or Charity?Next PostMasculine? Feminine? Neutral? Or Just Confusing?